Ever heard the tune ‘Crave You’ by Flight Facilities? I present the 18th century version in Lady Cunliffe, who may actually have been dripping in gold. 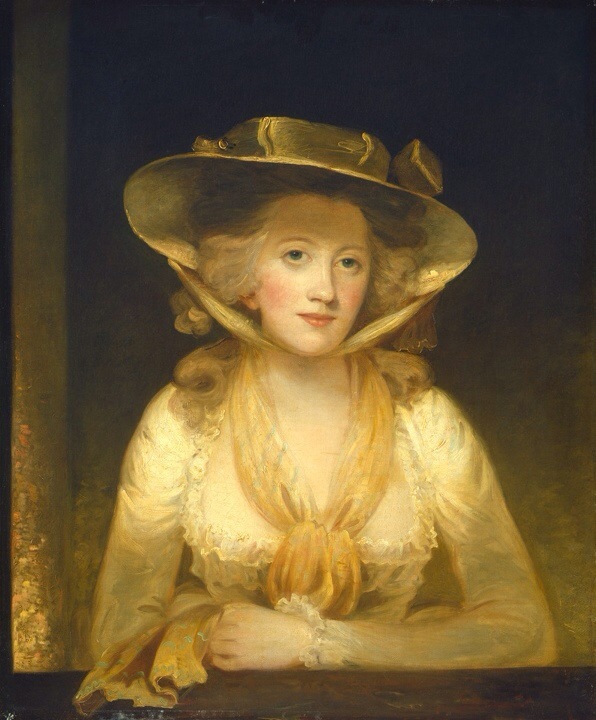 When Lady Cunliffe (nee Harriet Kinloch) married Sir Foster Cunliffe, 3rd Baronet, in 1781, the Cunliffe family was a generation away from two words that wrinkled society noses: merchant and slavery. Hoppner’s portrait was completed right before or right after they wed, and may have alluded to the less than respectable Cunliffe family riches that were accumulated mid-century. The first Foster Cunliffe–Sir Foster Cunliffe’s grandfather–was born in 1685 and made his wealth as a Liverpool merchant. The Virginian tobacco trade was just emerging in his hometown in the early 1700s, and he made a great deal of money on Oronoco weed (originally cultivated by John Rolfe, Pocahontas’ husband), which he sold to the French. What filled his coffers the most, though, was the Atlantic slave trade. To get an idea of what occurred during Cunliffe’s lifetime, the first half of the 18th century saw an expansion of some 5,000 ships from the beginning of the century to a whopping 45,000 before 1750. Cunliffe, as one of a hundred slave traders in Liverpool, owned 26. Those ships transported West Africans to the sugar islands, but they also carried German Palantines (sold as indentured servants) as well as convicts to the Americas. Exporting commodities from the sugar islands provided a supplemental income, but the trade that brought the family into affluence was falling out of favor by the time Lady Cunliffe entered the picture. By 1758, upon Foster Cunliffe’s death, Cunliffe’s sons followed in their father’s mayoral footsteps and took political offices. The company went defunct in 1759 and the family began distancing itself from its role in slavery. Thanks to their investments, the following generations joined the landed gentry and used their fortune to buy the hallmarks of social ascent, including the dripping in gold Hoppner portrait above.